Most ticks do not carry diseases, and most tick bites do not cause serious health problems. But it is important to avoid and check for ticks, and to remove a tick as soon as you find it. Removing the tick completely may help you avoid diseases such as Lyme disease that the tick may pass on during feeding, or a skin infection where the tick bit you. Learn where ticks and deer that carry ticks are most commonly found in your community. Avoid those areas if possible. Cover as much of your body as possible when working or playing in grassy or wooded areas. Wear a hat, a long-sleeved shirt, and long pants with the legs tucked into your socks. Keep in mind that it is easier to spot ticks on light-coloured clothes. Use insect repellents, such as products with DEET. Clear leaves, brush, tall grasses, woodpiles, and stone fences from around your house and the edges of your yard or garden. This may help reduce ticks and the rodents that the ticks depend on. Remove plants that attract deer, and use barriers to keep deer—and the deer ticks they may carry—out of your yard. Call your local landscaping nursery or county extension office to see if your yard can be treated for ticks with nonchemical or environmentally safe methods. When you come in from outdoors, check all over your body for ticks, including your groin, head, and underarms. Comb your hair with a fine-toothed comb, or have someone check your scalp. Ticks can come into your house on clothing, outdoor gear, and pets. These ticks can fall off and attach to you. Check your clothing and outdoor gear. Remove any ticks you find. Then put your clothing in a clothes dryer on high heat for 1 hour to kill any ticks that might remain. Check your pets for ticks after they have been outdoors. Check your children daily for ticks, especially during the summer months. Use fine-tipped tweezers to remove a tick. If you don't have tweezers, put on gloves or cover your hands with tissue paper, then use your fingers. Do not handle the tick with bare hands. Do not grab the tick around its swollen belly. You could push infected fluid from the tick into your body if you squeeze it. 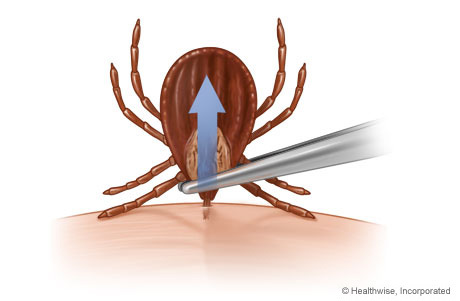 Gently pull the tick straight out until its mouth lets go of your skin. Do not twist the tick. This may break off the tick's body and leave the head in your skin. If part of the tick stays in the skin, leave it alone. It will likely come out on its own in a few days. Tape the tick to a piece of paper and put it in a dry jar or ziplock bag for later identification if needed. After the tick has been removed, wash the area of the tick bite with a lot of warm, clean water. Be sure to wash your hands well with soap and water also. You may cover the wound with a thin layer of petroleum jelly, such as Vaseline, and a non-stick bandage. Apply more petroleum jelly and replace the bandage as needed. Some ticks are so small it is hard to see them. This makes it hard to tell if you have removed the tick's head. If you do not see any obvious parts of the tick's head where it bit you, assume you have removed the entire tick, but watch for symptoms of a skin infection. If you have a rash, headache, joint pain, fever, or flu-like symptoms, this could mean you have an illness related to a tick bite. If you have any of these symptoms, or symptoms of a skin infection, call your doctor. Smother a tick that is stuck to your skin with petroleum jelly, nail polish, gasoline, or rubbing alcohol. Burn the tick while it is stuck to your skin. Smothering or burning a tick could make it release fluid—which could be infected—into your body and increase your chance of infection. There are some tick-removal devices that you can buy. If you are active outdoors in areas where there are a lot of ticks, you may want to consider buying such a device. Gammons M, Salam G (2002). Tick removal. American Family Physician, 66(4): 643–646. Also available online: http://www.aafp.org/afp/20020815/643.html. Gentile DA, Lange JE (2001). Tick-borne diseases. In PS Auerbach, ed., Wilderness Medicine, 4th ed., pp. 769–806. St. Louis: Mosby.